lose weight, get fit, change bad habits, change your lifestyle for the better? 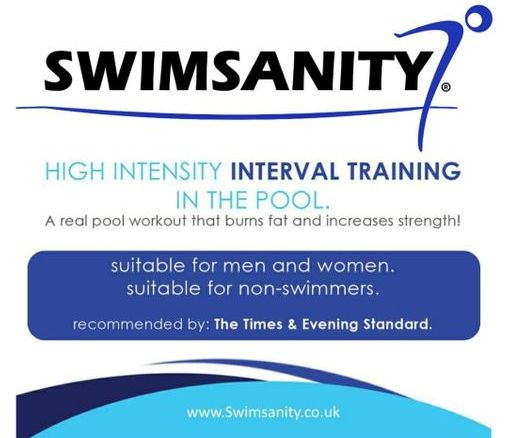 Swimsanity, developed in London by swimming lessons london- delivers a high intensity aerobic and conditioning workout class, with much of the forces (caused by gravity) on the bodies joints eliminated. Ideal for losing weight, getting toned, recovery from injury, improve aerobic fitness. .High energy music helps you keep working to your full ability. Suitable for swimmers and non-swimmers alike. Click on Logo above to visit Swim-sanity website or check out the video. Swimming lessons london not only offer the best swimming lessons in london, but also offer a home visit swimming lessons service for those with their own pool, who dont have the time to travel to us. Our home visiting teacher can come to you! We cover Kensington & Chelsea, westminster, camden, fulham and zones 1 and 2 in london. Booking cancellations must be made with 24 hours notice.